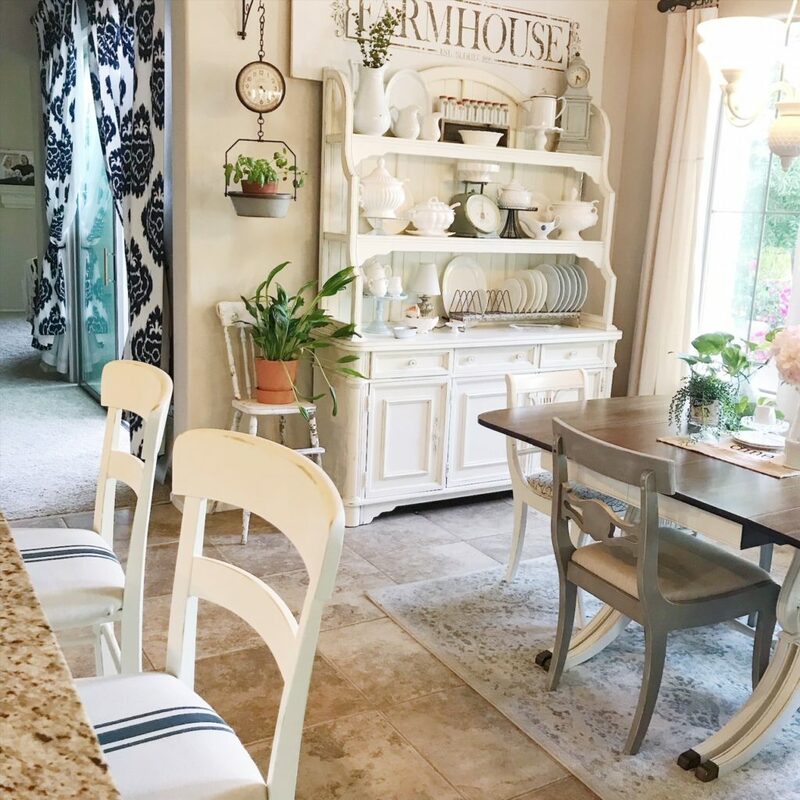 Bar Stools: How to go from Boring to Farmhouse Favorite! I visit my mom each week. She lives alone at 92 years old and enjoys our weekly visits. Since it’s on my way home from Mom’s house, I often stop at my favorite thrift store, YAY!!! 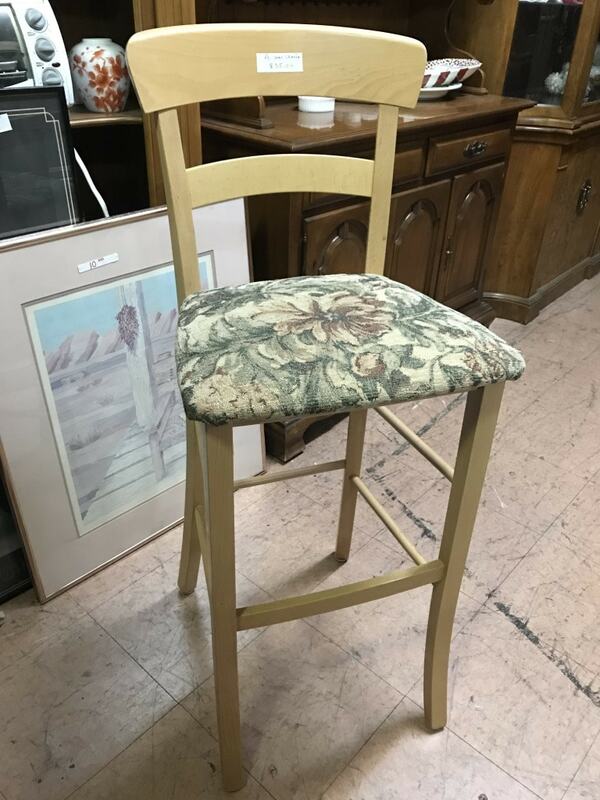 One day as I was perusing the aisles of furniture stacked to the ceiling I noticed a couple of bar stools turned upside down on top of a very large armoire. My first thought was, “Hey, I need a couple of bar stools” , so I pulled one down to have a look. This is how she looked when I found her. Even the cashier was surprised by the good price. I love it when I find a great deal on something I actually needed, (ok, wanted really bad, whatever). 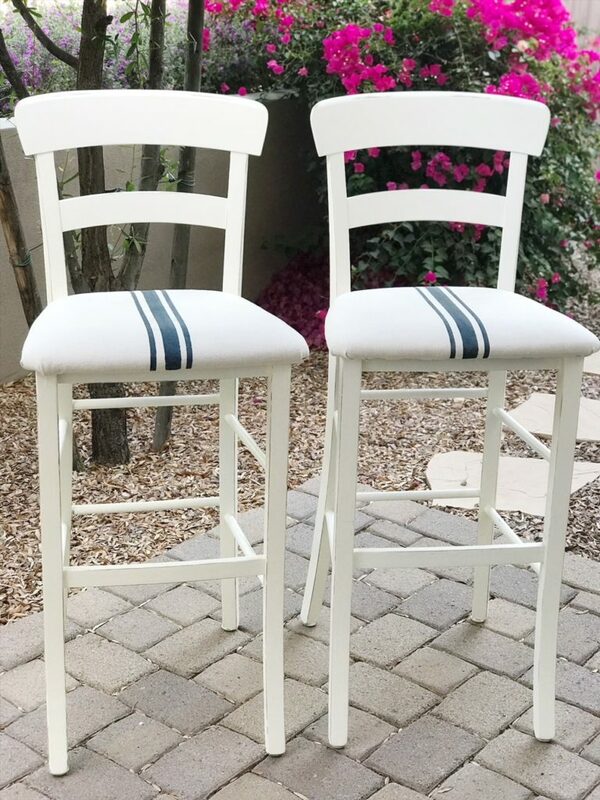 Anyhow…before I even got home I knew what I wanted to do with these bar stools…help them find their inner Farmhouse. 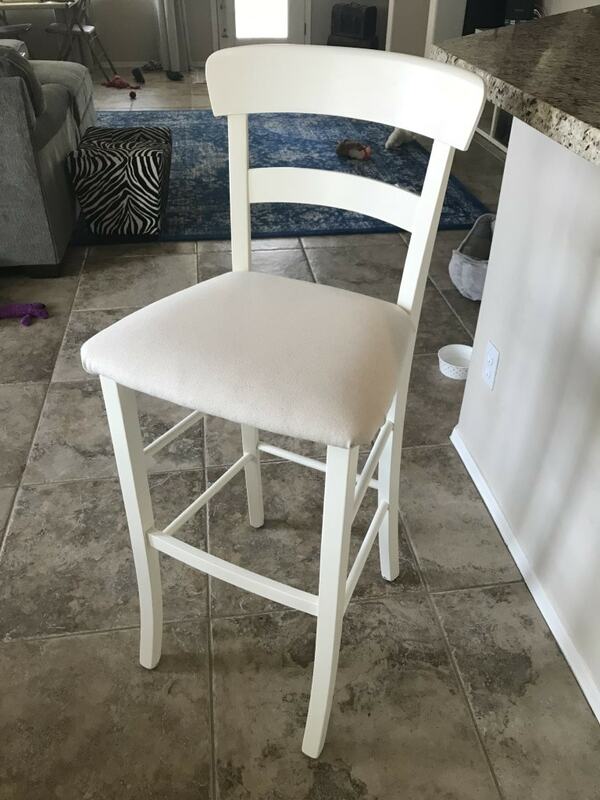 So I did what any other diy’er would do….I went to Wal-mart and bought some inexpensive chalk paint, Waverly Inspirations Chalk Paint in Ivory. By the looks of the bottle it seemed to be pretty close to the color of my hutch and at such a great price I figured I’d give it a try. I’m very happy with the results! It went on nice and smooth…has great coverage…and the color was almost an exact match with my hutch!!! WIN!!! The first thing I did was give them a good wipe down with my Norwex Enviro cloth, it gets all the grease and grime off without using any chemicals. Then I sat them at the bar to make sure they fit and I was super happy they did because as soon as I get them all Farmhouse’d up I can sit at the bar and talk to Dee while he cooks dinner for us. He’s a keeper, you guys...he loves to cook! it’s hard to believe that this particular fabric was a hot item one day, but styles come and go and everyone has different taste. 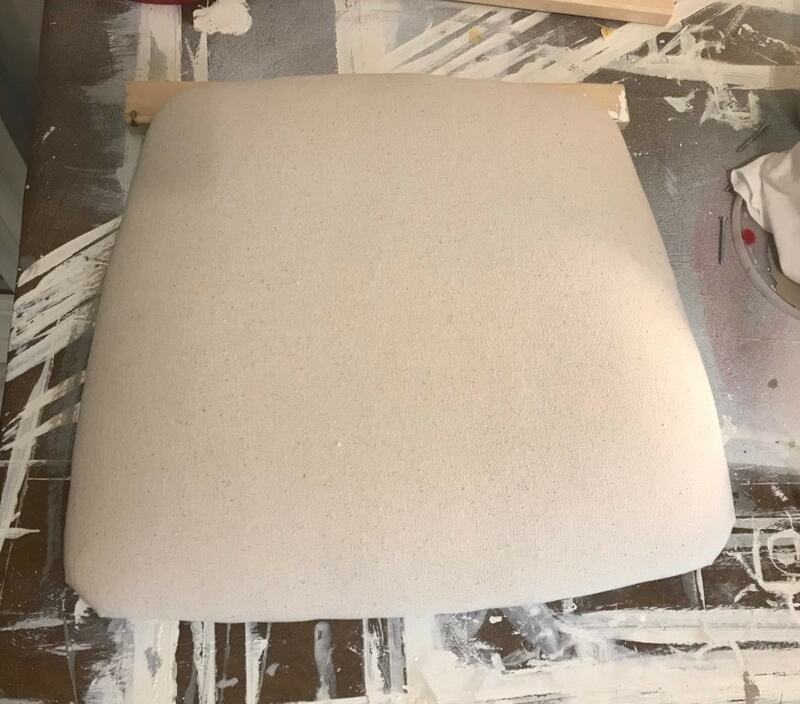 Fortunately…fabric can be changed…so I took off the seats and prepared to do just that. Time to cover this up! 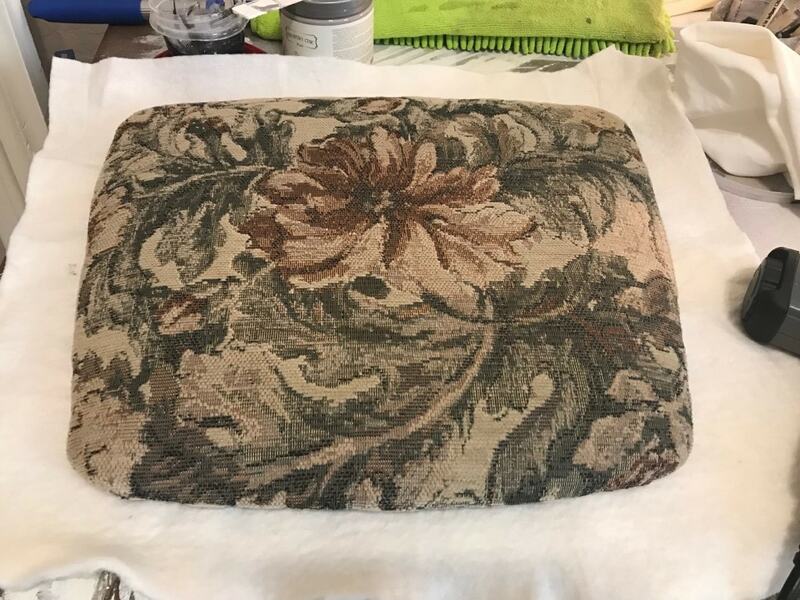 Seat recovered with drop cloth fabric. 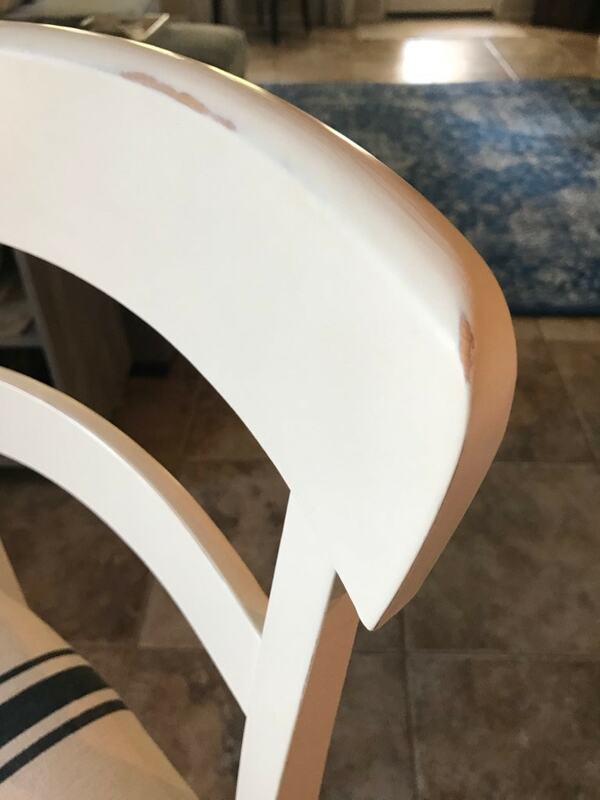 (I know because I have several) so why wouldn’t I use them for reupholstering seats? I love drop cloth fabric! 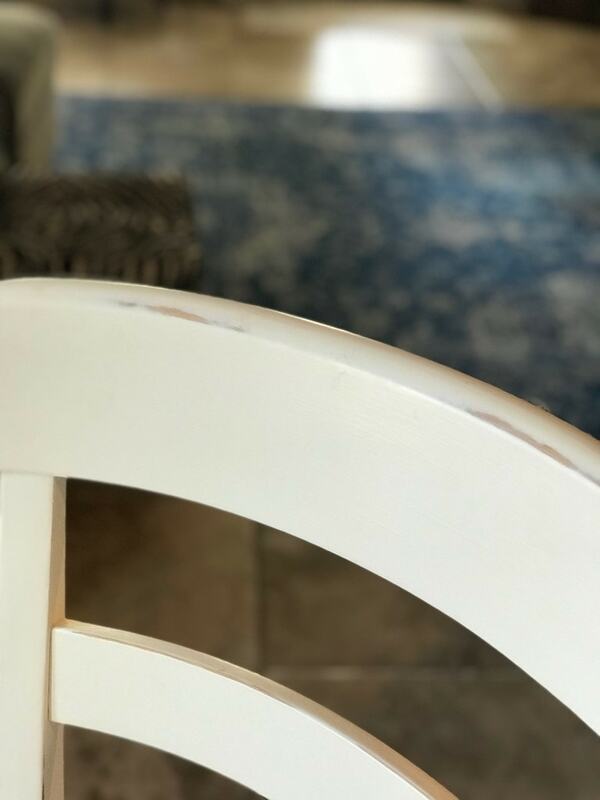 The texture, the color, the price.…they are all perfect for me and since I have drop cloth curtains in my dining room these drop cloth bar stool seats will fit right in. 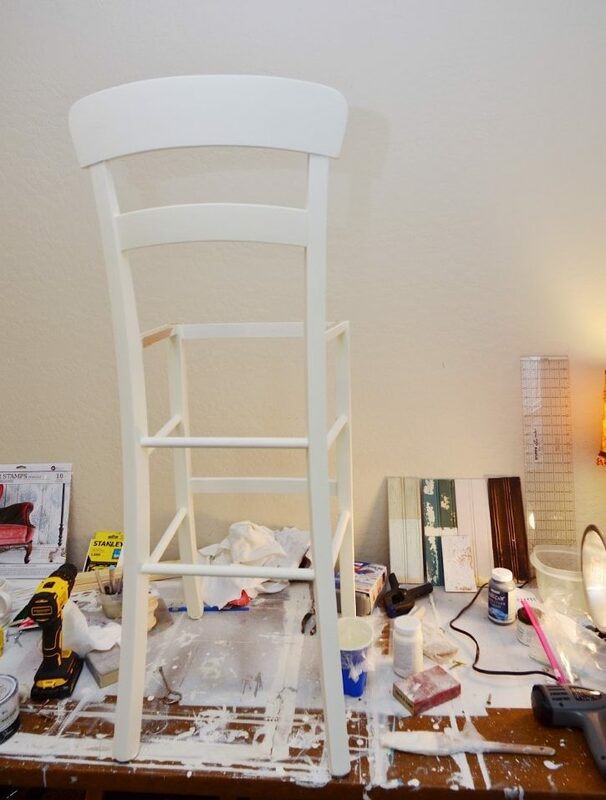 I still gave the stools a light sanding, just to rough up the wood since it had a bit of a glossy sheen to it and then I started painting...with a brush! It was a bit tricky on the slender legs and the dowel cross pieces but I prefer brushing to spraying any day! 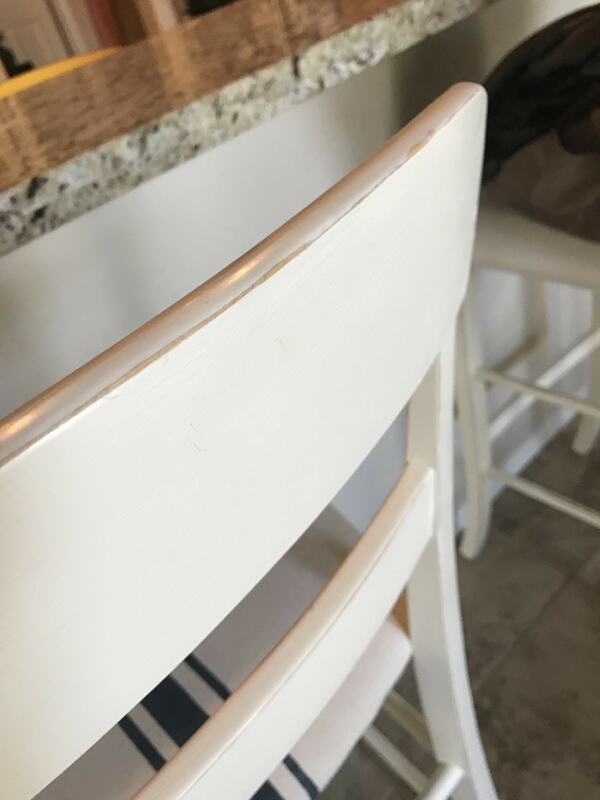 After a couple coats of chalk paint I used Annie Sloan Clear Wax to seal them and get that wonderful sheen. Looks good…but not quite finished! 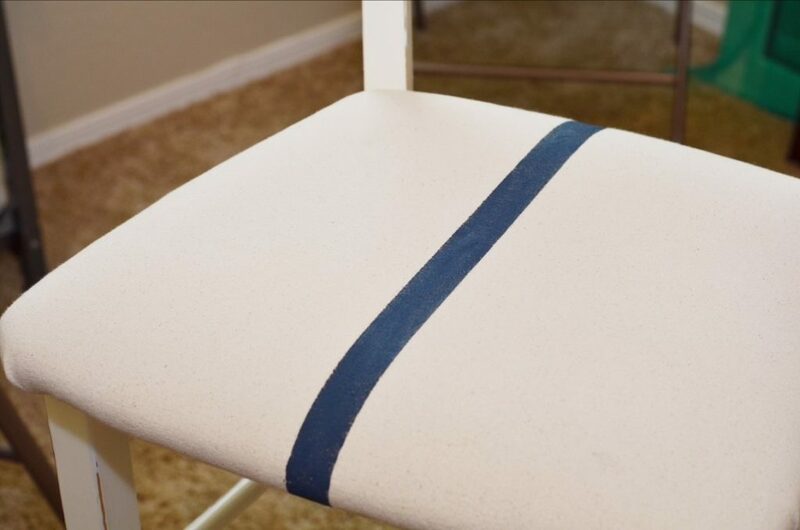 Farmhouse Stripes…you know the ones…the same stripes on vintage grain sacks. We have a huge blue rug in the family room so if there is an accent color to be used in this area of the house, blue it is. Our dining and family rooms are pretty much one big room and I like to have it all tie together. however, I did measure to find the middle of the seat and from there I just eyeballed it. 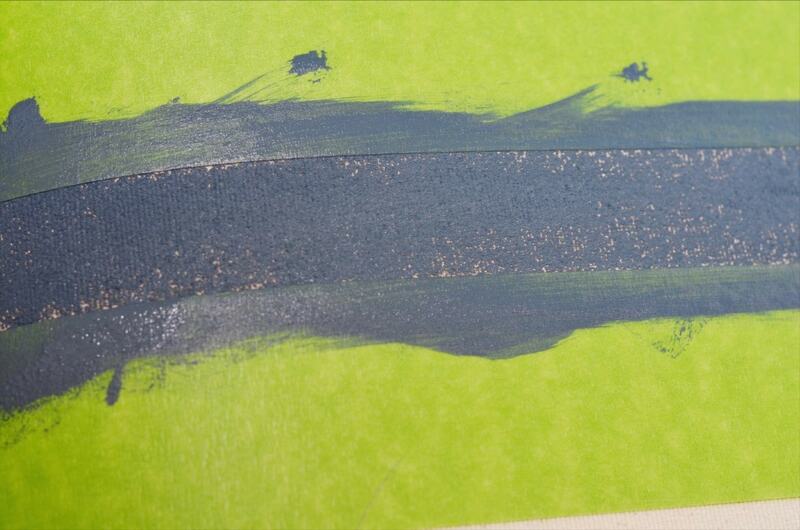 I used my green Frog Tape to tape off the larger center stripe, it’s mostly an inch wide…don’t look too closely. Then I used my Dunn Edwards paint in Nightfall which is the same color on the outside of my front door. 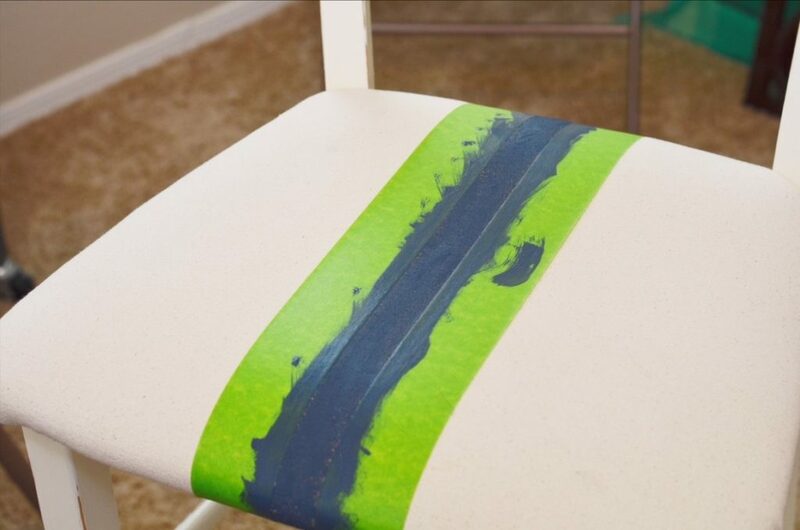 I had the paint already and it’s blue so I figured I’d just use what I had, however, I did buy some textile medium to mix with the paint so that it would adhere to fabric and using a sponge brush, I just painted it on. I didn’t want it to be perfect so wasn’t concerned with making sure it was completely covered. for a couple of hours before I taped off the smaller stripes on either side. I didn’t want to take a chance on smudging the center stripe with the tape that I knew would have to be laid right over it. Again, I eyeballed it, and painted the stripes on. Once they were good and dry I gave the seats a couple coats of Scotch Guard. They look fabulous in my dining room and are a super close match to my Hutch. 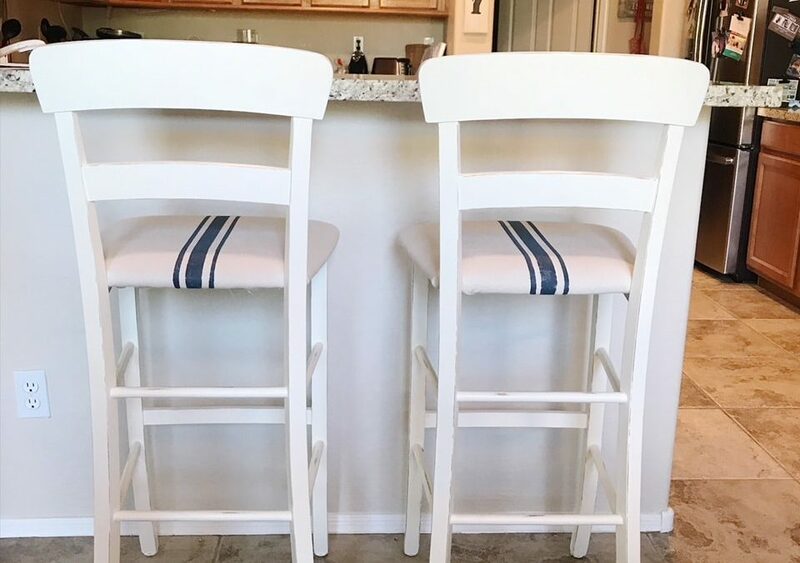 I couldn’t be happier with these $35.00 thrift store bar stools. I do enjoy visiting my mom….and hitting the thrift store after is always a bonus! Hi! I'm Cindy....wife, mom, Mimi (aka grandma) and home décor enthusiast. 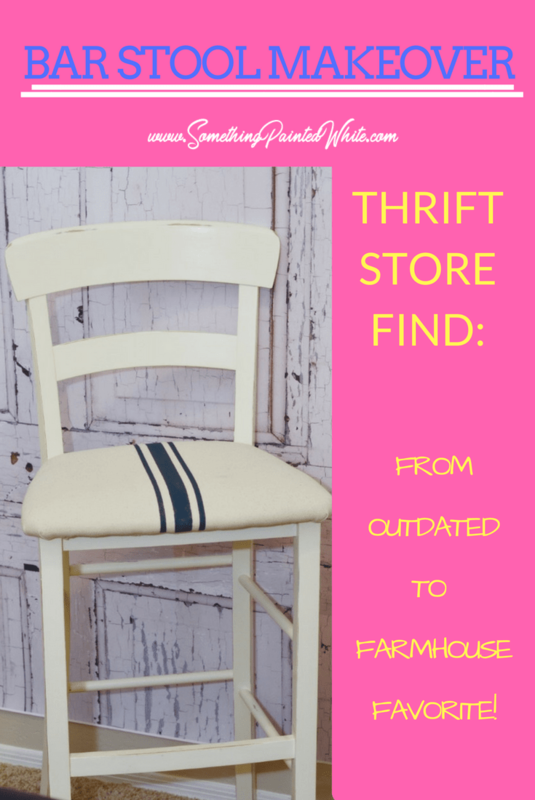 I love thrift stores, flea markets, yard sales and good junk!